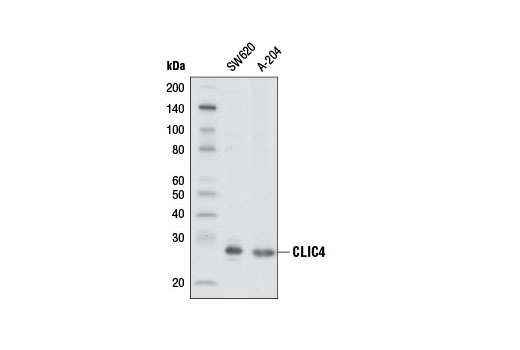 Western blot analysis of extracts from SW620 and A-204 cells using CLIC4 (D2A7D) Rabbit mAb. Immunoprecipitation of CLIC4 from HT-1080 cell extracts using Rabbit (DA1E) mAb IgG XP® Isotype Control #3900 (lane 2) or CLIC4 (D2A7D) Rabbit mAb (lane 3). Lane 1 is 10% input. Western blot analysis was performed using CLIC4 (D2A7D) Rabbit mAb (lane 3). 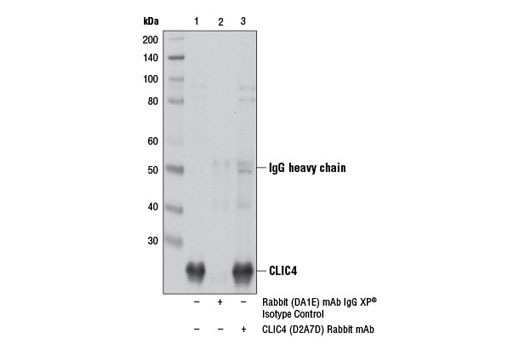 CLIC4 (D2A7D) Rabbit mAb recognizes endogenous levels of total CLIC4 protein. Monoclonal antibody is produced by immunizing animals with a synthetic peptide corresponding to residues surrounding His111 of human CLIC4 protein. Chloride intracellular channel (CLIC) proteins belong to a family of highly conserved transport proteins found as both soluble and membrane-bound forms (1). Although CLIC proteins have putative, selective chloride ion channel activity, they are structural homologs to members of the glutathione-S-transferase protein superfamily and are likewise regulated by redox status (2). CLIC proteins are distinct from other ion channels in that they are found as both soluble and integral membrane forms, and their form determines their function (3-6). Chloride intracellular channel proteins are ubiquitously expressed in numerous tissue types and are involved in diverse biological functions (1,2). Chloride intracellular channel 4 (CLIC4) is a well-studied member of the chloride intracellular channel family. Expression of CLIC4 is regulated by p53 and c-Myc, and CLIC4 is required for p53 and c-Myc-mediated apoptosis in some cell types (6,7). CLIC4 contributes to TNF-α mediated apoptosis independent of NF-κB (8). Moreover, CLIC4 regulates the maturation of keratinocytes, differentiation of adipocytes and blood vessel lumen formation (9-12). Research studies show that CLIC4 translocates from the cytoplasm to the nucleus in response to cellular stress (13). In addition, nuclear CLIC4 enhances TGF-β signaling (14). In human cancer tissues, CLIC4 is excluded from the nucleus of tumor cells and its expression is reduced in tumor epithelial tissues (15); conversely, CLIC4 expression is markedly elevated in the adjacent stroma of multiple human cancers. Researchers have shown that high stromal CLIC4 protein levels enhance tumor invasiveness and progression (16). Littler, D.R. et al. (2010) FEBS Lett 584, 2093-101. Oakley, A.J. (2005) Curr Opin Struct Biol 15, 716-23. Littler, D.R. et al. (2005) FEBS J 272, 4996-5007. Singh, H. and Ashley, R.H. (2006) Biophys J 90, 1628-38. Suh, K.S. et al. (2004) J Biol Chem 279, 4632-41. Fernández-Salas, E. et al. (2002) Mol Cell Biol 22, 3610-20. Shiio, Y. et al. (2006) J Biol Chem 281, 2750-6. Suh, K.S. et al. (2005) Cancer Res 65, 562-71. Kitamura, A. et al. (2001) Biochem Biophys Res Commun 287, 435-9. Bohman, S. et al. (2005) J Biol Chem 280, 42397-404. Suh, K.S. et al. (2007) J Cell Sci 120, 2631-40. Ulmasov, B. et al. (2009) Am J Pathol 174, 1084-96. Malik, M. et al. (2010) J Biol Chem 285, 23818-28. Shukla, A. et al. (2009) Nat Cell Biol 11, 777-84. Suh, K.S. et al. (2007) Clin Cancer Res 13, 121-31. Shukla, A. et al. (2013) Oncogene , [ePub ahead of print].